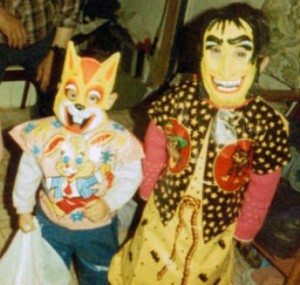 Christina Salmon and sister Alexanna Salmon pose for a Halloween photo. IGI-2013-003-0359, Mike and Dallia Andrew Collection, Igiugiq Tribal Library. When howling winds reduce birch trees to skeletons, croaking ravens return to hollowed woods, and creeping termination dust bask burnt-orange mountains in a ghostly glow, it must be October in Alaska. October not only brings chilling weather but one of the world’s most beloved and ancient holidays, Halloween. In Alaska that holiday arrived late, brought by immigrating Americans after 1867. Still, most Alaskans have embraced Halloween, and its signature pastime, telling ghost stories. 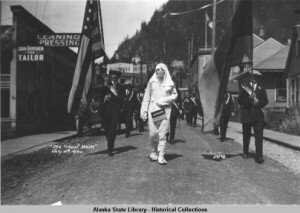 Ghost walking in parade, July 4th, 1924, Juneau, Alaska. ASL-P87-1207, Winter and Pond Photographs, Alaska State Library-Historical Collections. Propsectors of the famed Alaska Gold Rushes also told their share of ghost stories about forlorn females. Local legend says that a man known as “Klondike Ike,” checked in the Golden North Hotel in Skagway with his fiancee, Mary. The next day Ike set out in search for gold, but never returned. A devastated Mary locked herself in her room on the 3rd floor of the hotel and eventually died. Patrons occasionally report sightings of “Scary Mary” in the corridors and hallways. Accordingly, she appears as a shadowy apparition, peering out of windows, looking for her long-lost Ike. It should also be noted that virtually the same story is told about the Golden North Hotel in Fairbanks.